I destroy coats. I own a wool coat and a leather jacket and I've managed to tear both right pockets and shred the linings of both. The shells of both coats are in fine shape, however. It's mending time! Here's the old pocket. The first step was cutting it off of the coat. 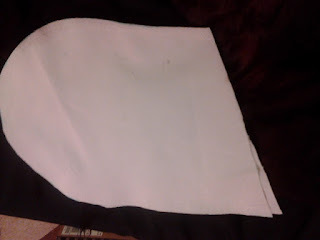 Then I laid out the pocket on some canvas I had left over from the corset project. I traced out two shapes and sewed them together with a zigzag stitch, leaving the top end open, of course. 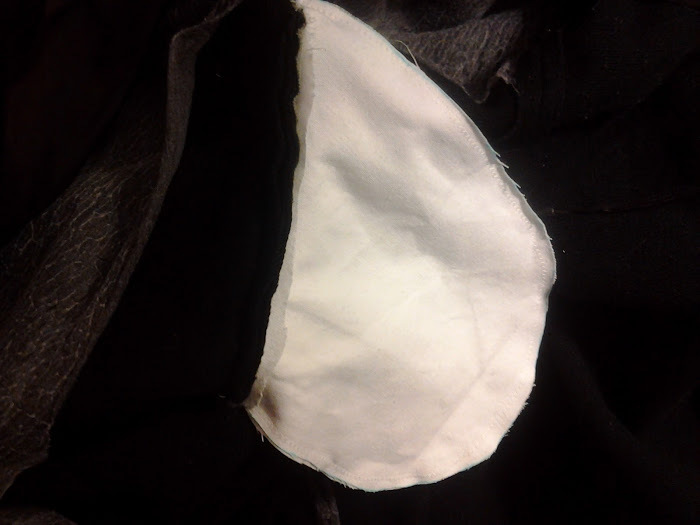 The next step was attaching the new pocket to the coat. 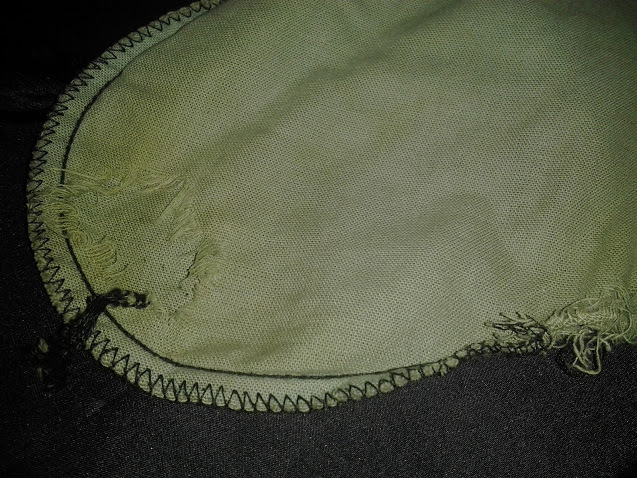 To do this, I turned the pocket inside out and lined the edges up with pocket opening and the old seam allowances. At this point, the pocket was sticking out of the right side of the coat. I stitched the pocket to the old seam allowances then turned the pocket right-side out. The pocket now sits inside the coat, as seen below. 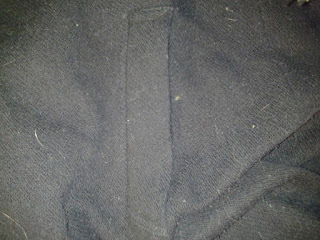 As you can see below, the new pocket material is invisible from the outside of the coat, just like the original pocket. Like everything I own, the coat is covered in cat hair. That's a problem for another day. 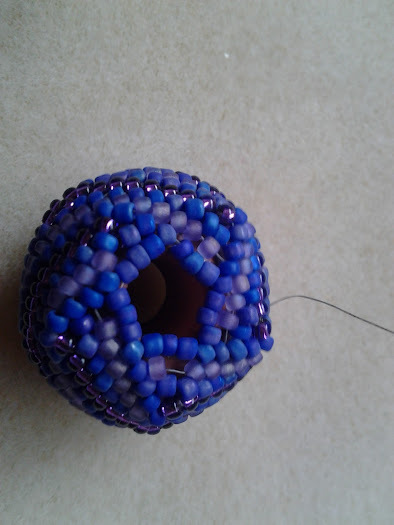 I'm making beaded beads by covering macrame beads with peyote stitch. 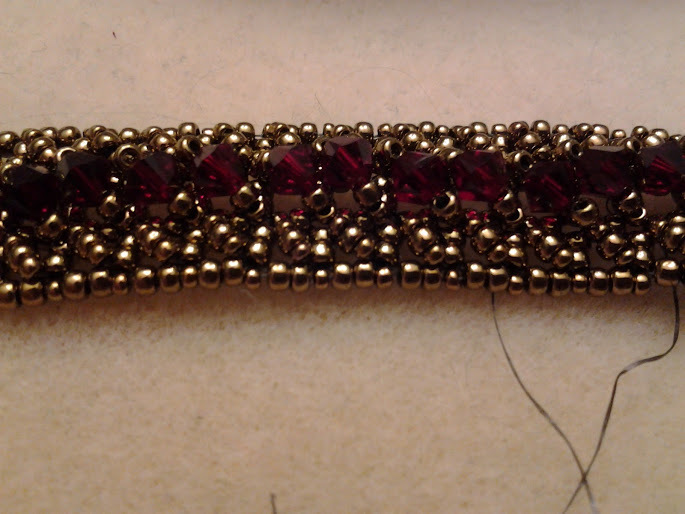 I start at the widest part of the bead then work towards the end. The macrame beads have holes large enough to accommodate the beaded rope. I used natural light for the photos, but it's rather grey out today so everything looks much bluer than it actually is. 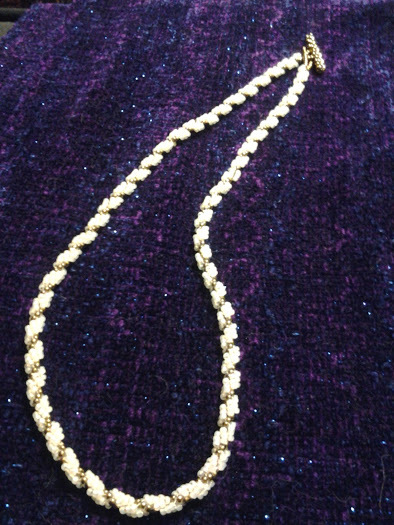 The actual necklace is much more purple. 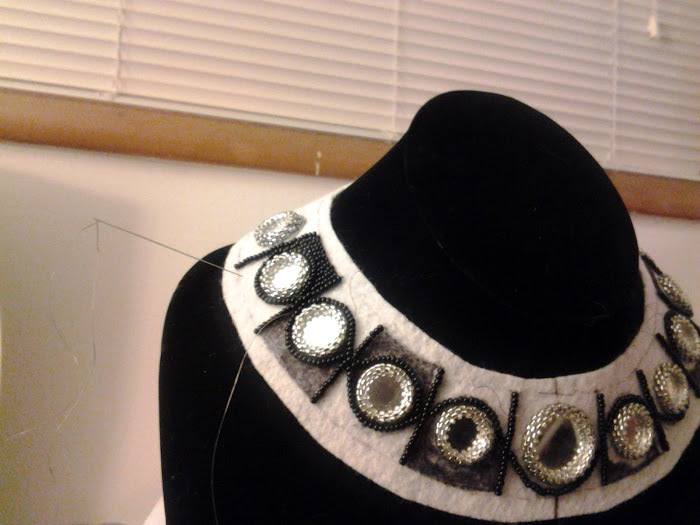 Today I put a bit of work into the bead embroidered collar. Before filling in a space with black size 15 beads, I color the stiffened felt with a permanent marker. 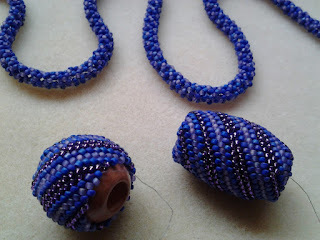 Matching the background to the beads is important when filling in a flat area. While the background need not match the foreground perfectly, it should be colored to be unobtrusive. 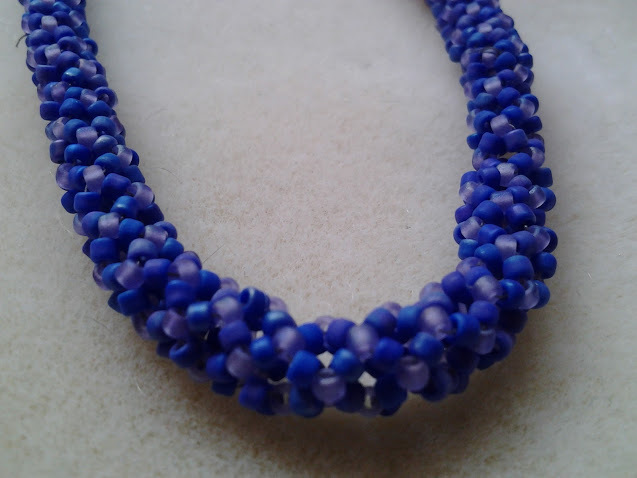 No matter how tightly placed the beads are, there will be gaps where the background can show through, and the white felt would be particularly obvious. I used a fine-tipped Sharpie marker. 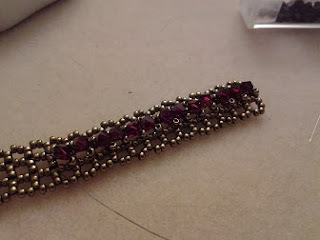 A side-effect of packing and unpacking my craft supplies for semester break migrations is re-discovering projects I'd set aside in my Unfinished Project Bin. Today I took one out and finished it. This stitch is called spiral rope, and it's one of my favorite techniques. 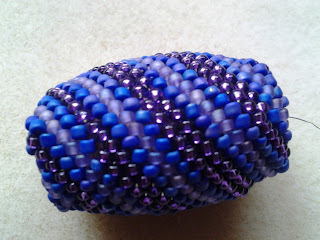 It works up quickly and produces a supple rope that looks nice alone or is great as a base for a pendant. 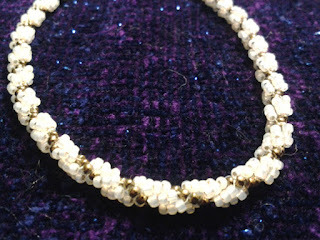 This necklace uses metallic bronze seed beads for the core and gilt-lined white opal seed beads for the outer layer. Both are size 11. The clasp is a peyote stitch toggle. A pair of socks for my grandpa. 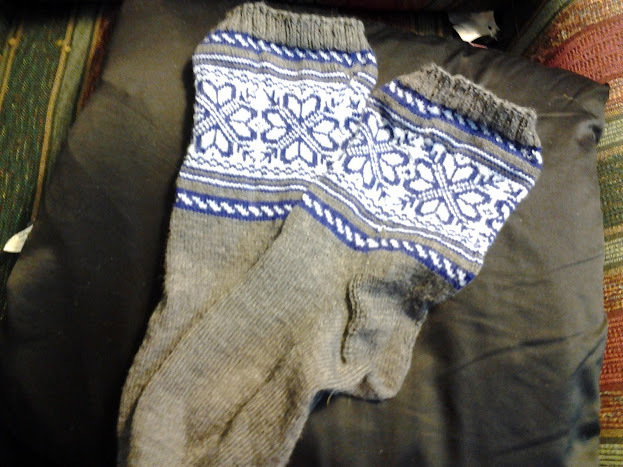 I finished them at Christmas, but I want them to fit perfectly, so I've taken them back for a toe adjustment. They're knit from the toe up on double-pointed needles. 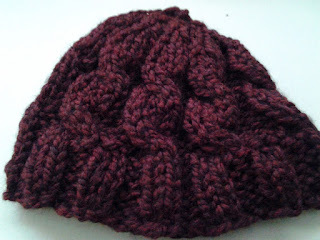 I made up the pattern as I went along. 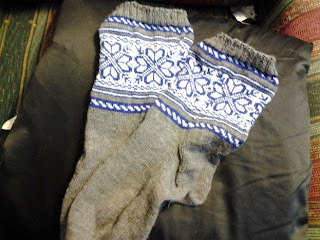 The snowflake motif was adapted from a book on Norwegian mitten patterns. This hat is knit flat on straight needles using super bulky yarn, then seamed to finish. Clearly I'm still mastering the focus of my camera phone. 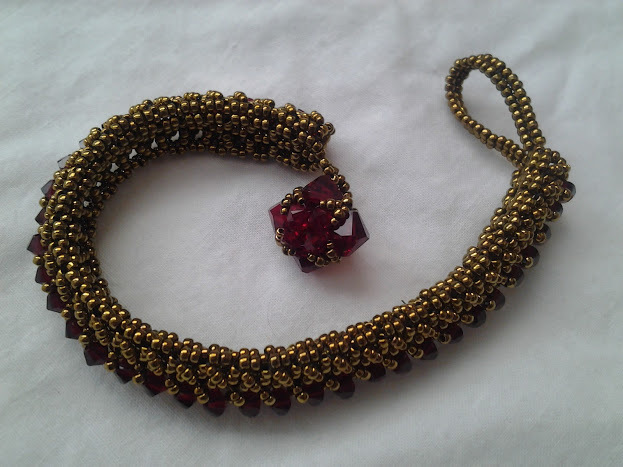 The big red crystal cluster is an improvised beaded bead that forms a toggle clasp. I'm probably going to try the Crystal Rose project by Sonoko Nozue. 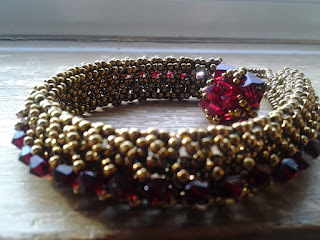 I haven't tried bead crochet yet, but I think I can get a similar effect with herringbone ropes. 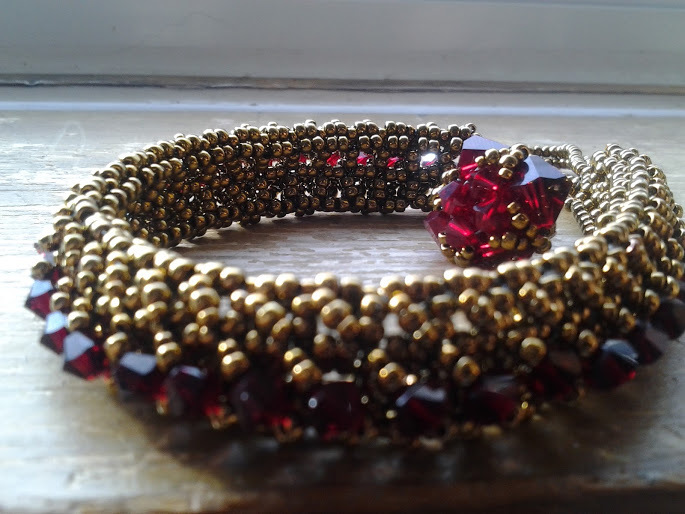 A supporting layer of unadorned right-angle-weave gives the bracelet dimension. 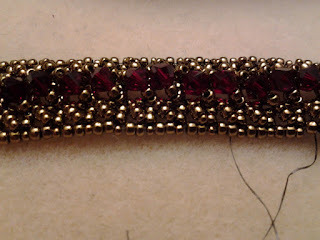 After stitching one side of the support layer to the top, folding it into position and trying it on my wrist, I noticed that adding the support layer takes up some of the slack in the bracelet. 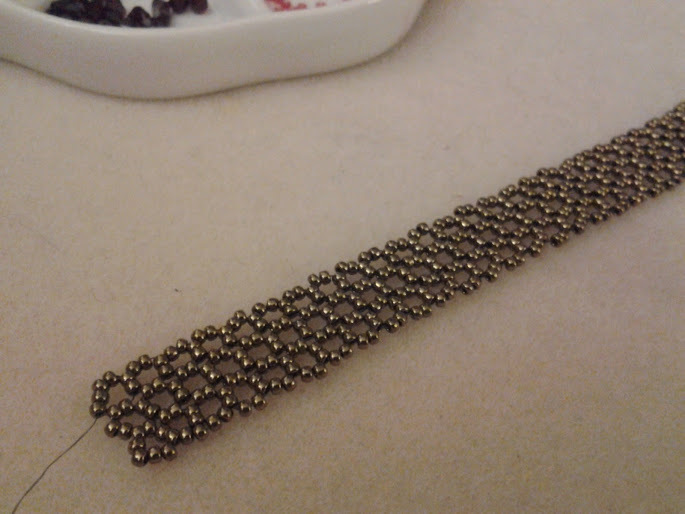 I need to add a few more repetitions of the main pattern and extend the support layer accordingly to get the length I want. 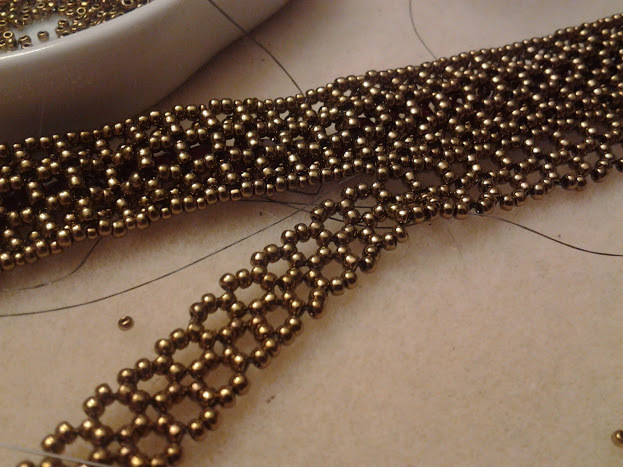 Now that the holiday gift-making extravaganza is over, it's time to make a shiny object for myself. I'm following a pattern from the June 2011 issue of Bead & Button magazine by Donna Pagano Denny. The bracelet is based on a band of right-angle-weave, which is then embellished in layers to create a three-dimensional form. I've chosen metallic bronze seed beads and Siam Swarovski crystals. 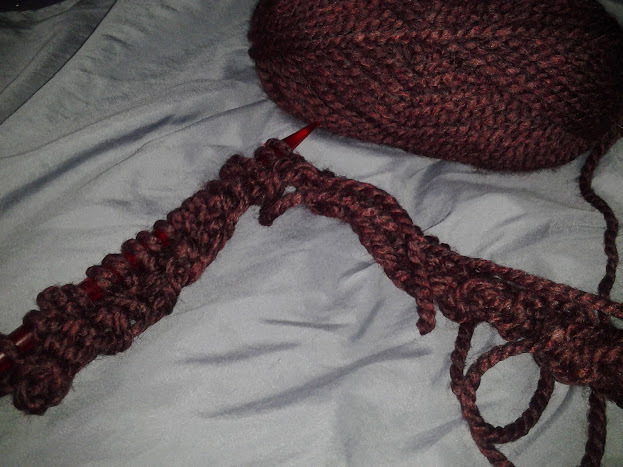 So far this pattern works up quickly.